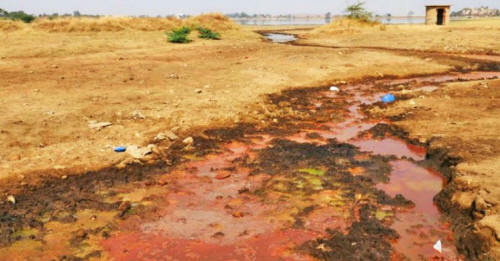 Polluted water flowing into Isnapur Lake, India. Pharmaceutical companies are fuelling the rise of superbugs by manufacturing drugs in factories that leak industrial waste, says a new report (Drug Resistance through the Back Door - How the Pharmaceutical Industry is Fuelling the Rise of Superbugs through Pollution in its Supply Chains) which calls on them to radically improve their supply chains. Factories in China and India - where the majority of the world's antibiotics are produced - are releasing untreated waste fluid containing active ingredients into surrounding areas, highlights the report by a coalition of environmental and public health organizations. Ahead of a United Nations summit on antimicrobial resistance in New York next week, the report - by the European Public Health Alliance (EPHA) and pressure group Changing Markets - calls on major drug companies to tackle the pollution which is one of its root causes. "as big a threat as terrorism," according to NHS England's Chief Medical Officer Dame Sally Davies. If no action is taken antimicrobial resistance (AMR) will kill 10 million people worldwide every year - more than cancer - according to an independent review into AMR last year led by economist Professor Jim O'Neill. Changing Markets compiled previous detailed reports and conducted its own on-the-ground research looking at a range of Chinese and Indian drug manufacturing plants making products for some of the world's biggest pharmaceutical companies. "pumping tonnes of toxic and antibiotic-rich effluent waste into the fields and waterways surrounding the factory," according to Chinese state television. "high levels of hazardous waste" and "large volumes of effluent waste" being dumped into the environment. Most major drug companies display a "shocking lack of concern" about pollution in their supply chains, Changing Markets claims. It is calling for companies that fail to demand environmentally sound manufacturing and waste treatment techniques from their suppliers to be blacklisted. "Big Pharma's role in fuelling drug resistance is all too often overlooked when policies to curb the spread of AMR are being discussed. "Our research has shown that the industry is failing to take the necessary action to address the threat of a looming environmental and public health crisis in which it is playing a key part." The drugs also prevent infection during surgery and treatments like chemotherapy, which can wipe out the body's immune system. As the bugs become resistant to the drugs used to treat them, experts fear more people will die of infections - and common medical procedures will become high risk. A "critically important" antibiotic is one which is either the sole treatment option or one of few alternatives for a serious infectious disease in humans. "Today's briefing casts light on how big polluting factories are fueling the emergence of drug resistant bacteria. "With prescribers of both human and veterinary medicine increasingly urged to take action on antibiotics, the pharmaceutical industry must now play its part in tackling this crisis."